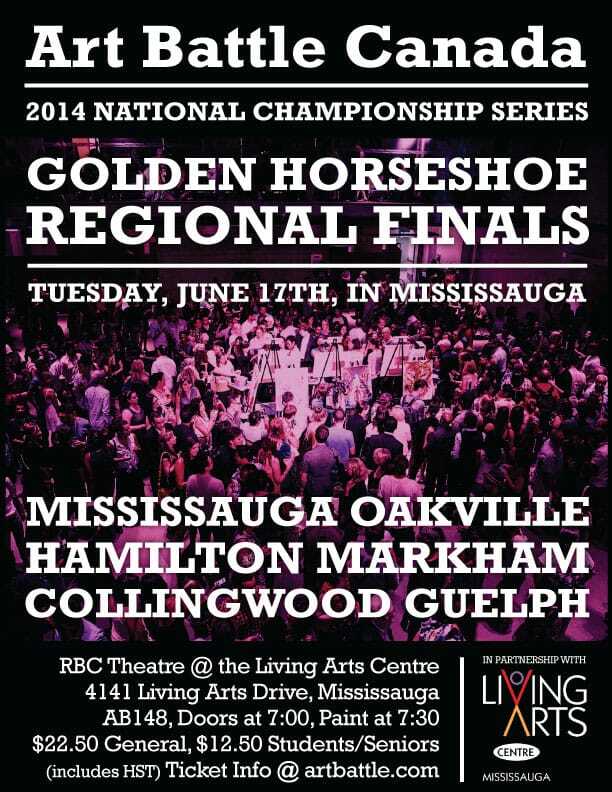 Art Battle Canada is pleased to announce the Regional Final for the awesome Arts communities in the Golden Horseshoe area of southern Ontario! The exciting event is being presented in proud partnership with the Living Arts Centre in downtown Mississauga. Join and share the event on Facebook > https://www.facebook.com/events/572219242899611/Join us June 17th for three inspiring rounds of live competitive painting. Winners and All-Stars from the 2013/14 Art Battle season in Mississauga, Oakville, Hamilton, Markham, Collingwood and Guelph will paint for the Golden Horseshoe Championship, a cash prize and most importantly a qualifying spot in the 2014 Art Battle National Championship which will be held July 26th in Toronto at The Mattamy Athletic Centre (which is formerly known as Maple Leaf Gardens!). Art Battle Canada has held events in 27 cities across the country this season! It’s always an inspiring night of talent, courage and community, don’t miss this wonderful celebration of skill, courage and community. See you at the Living Arts Centre on June 17th!